I saw a picture of these pancake coated bacon strips for the first time on Pinterest a few years ago and decided to give them a try. My first few attempts were incredibly messy and rather hideous to look at. Thankfully anything with bacon tastes great so they were still edible. Regardless, I’ve made them a few times since and have learned a couple of things along the way. 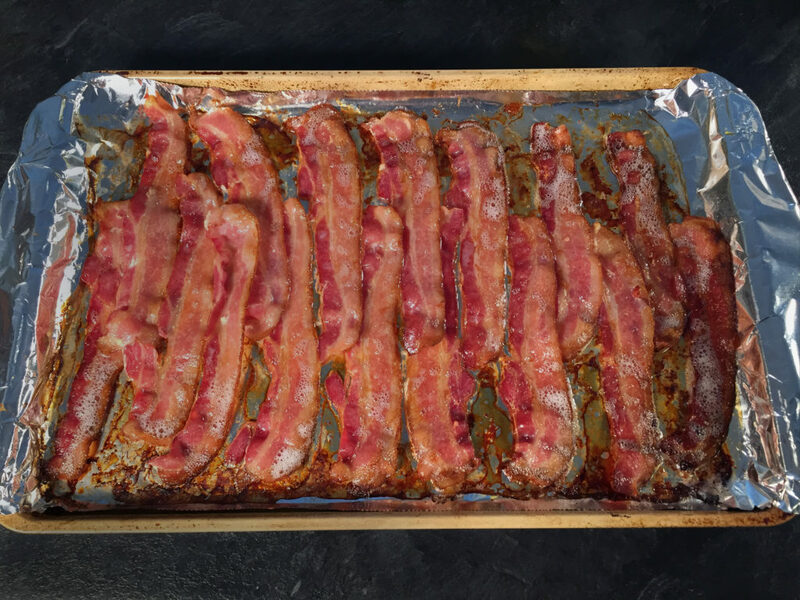 The best way to cook your bacon is in the oven on a cookie sheet. 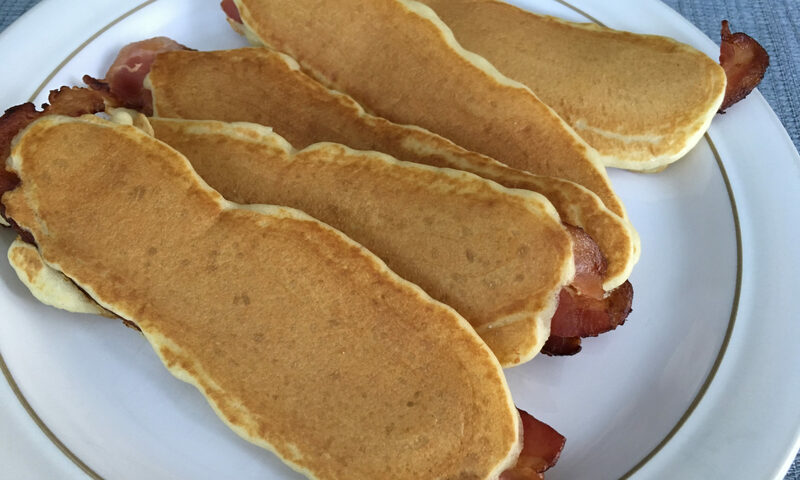 You want the bacon strips to be fairly flat when they go inside your pancake and pan frying tends to make the bacon go curly. The cookie sheet method also makes for a super easy clean up so that’s a big win too. For the actual batter, you can use whichever pancake recipe is your favourite. My preferred recipe is below (the salt content could probably be reduced as the bacon is already quite salty). You want a batter that is slightly on the thicker side. If it is too runny the batter just spreads all over the place and it’s hard to pour it in the bacon shape that we’re going for. I found the easiest way to get the right shape (and avoid unnecessary spills) is to put the batter in a squeeze bottle. I found mine at a kitchen store a while back but you could also re-use something like an empty ketchup or mustard bottle (Remember kids, Reduce, Re-use, Recycle!). You could also just pour/spoon that batter into the pan, I just find the squeeze bottle offers a lot more control. Once you’ve got your bacon cooked and your batter prepared, the assembly process is super easy. 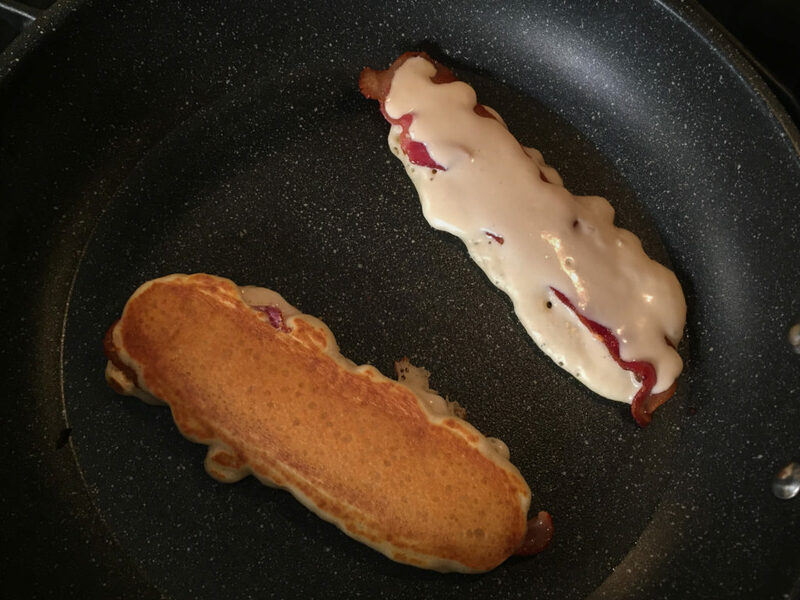 Just squeeze some batter in your heated pan roughly the size and shape of a strip of bacon, lay a piece of bacon on top, and then cover the top of the bacon with a bit more batter. Depending how heavy handed your are with the batter, this recipe makes enough for 8-10 bacon pancake strips. I normally buy 500g packs of thin cut bacon which is about 16 strips. I cook the whole pack and make as many pancakes as I can with a single batch of batter and then save immediately eat any bacon that’s leftover. The batter recipe below doubles very nicely and would give you enough batter for an entire pack of bacon if you wanted to do more. Serve the pancakes warm with butter and maple syrup. They’re highly addictive and surprisingly easy to make once you get the hang of it! Line a cookie sheet with foil and lay out strips of bacon. Cook bacon for 15-20 minutes (depending on the thickness of the bacon and how crispy you like it). Transfer cooked bacon to a plate lined with paper towel to absorb the excess fat. 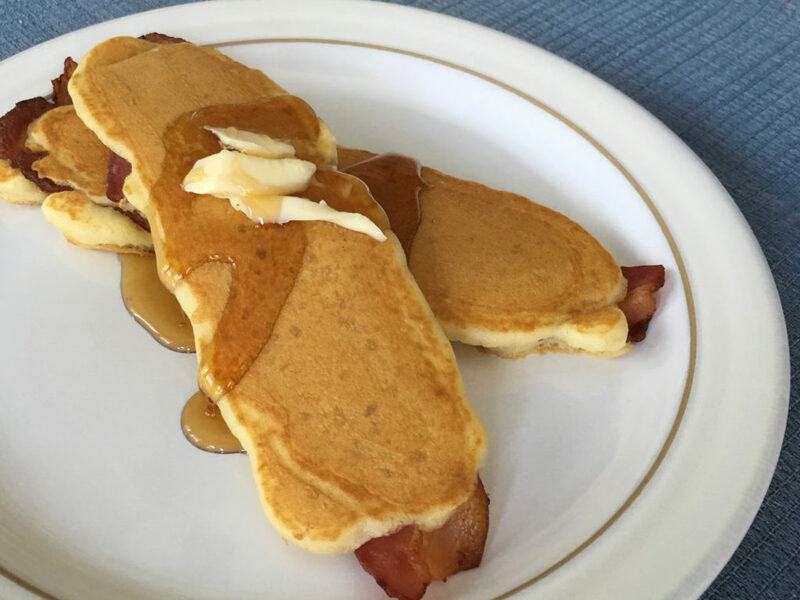 While the bacon is cooking, you can prepare your pancake batter. 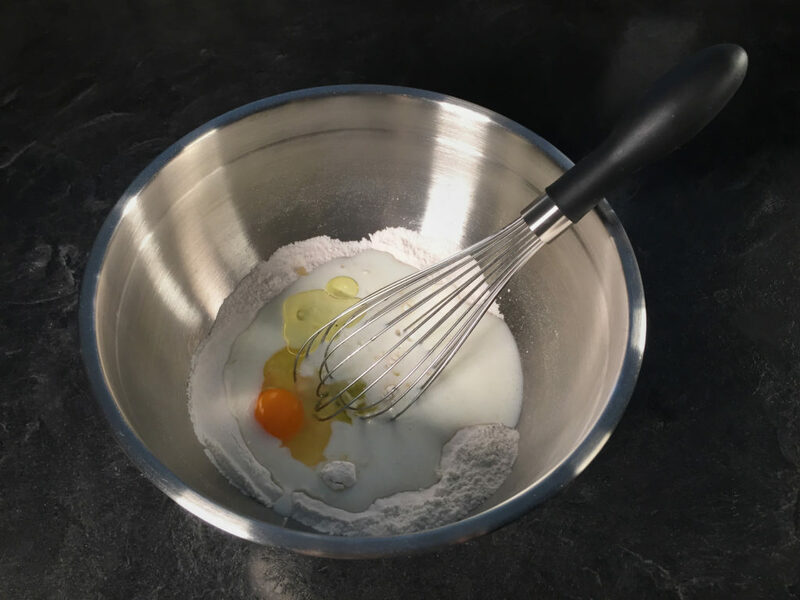 In a medium bowl mix together flour, sugar, salt and baking soda. 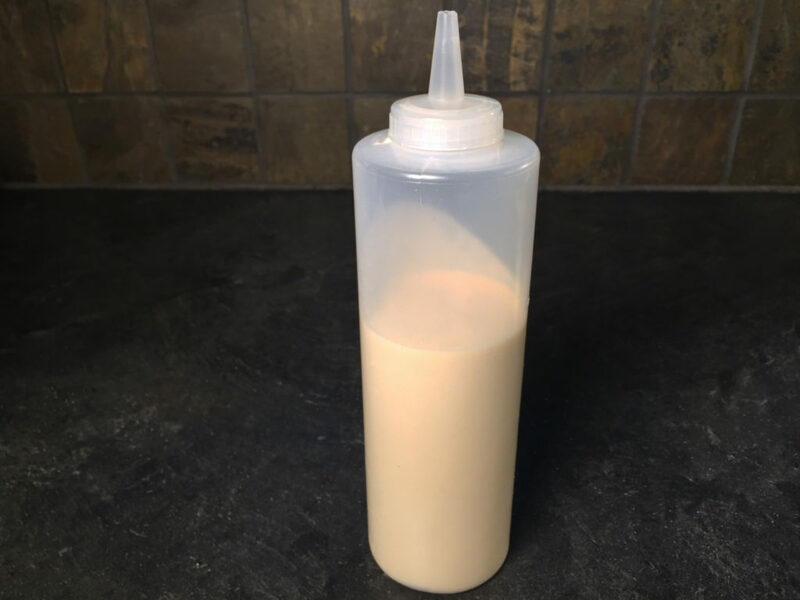 Transfer batter to a squeeze bottle. Pre-heat your frying pan or electric griddle to a medium heat (if you have really good non-stick pans, you won’t need to grease them, but if your pans are extra sticky, add a little bit of butter or oil to the pan before adding your pancake batter). 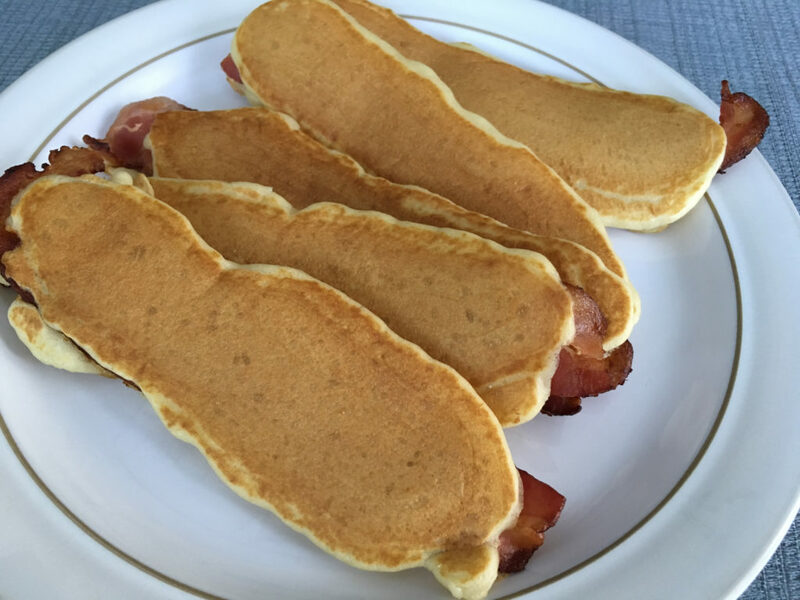 Squeeze/pour a small amount of pancake batter into the pan, roughly the size and shape of your bacon strips. Immediately place a strip of bacon on top of the pancake batter. Squeeze/pour a bit more batter on top of the bacon strip to roughly cover it. Flip pancakes when the surface of the bottom layer starts to bubble. These look great!! I bet a person could make a brunch ‘appie sized’ version!